Hear the future of music today and watch the next generation of leaders take shape. The Asheville Symphony Youth Orchestra program serves more than 170 of the very best young musicians in the greater Asheville area. The program consists of four orchestras, in addition to woodwind, brass, percussion, and chamber music ensembles. ASYO musicians participate in masterclasses, retreats, workshops, tours and social events. They also receive superb music instruction from many of the region’s most respected professional conductors and musicians and have the opportunity to perform throughout the community. Most importantly, whether or not students continue their music studies, they leave with a strong sense of discipline, increased confidence, and a deep appreciation for music and the arts. 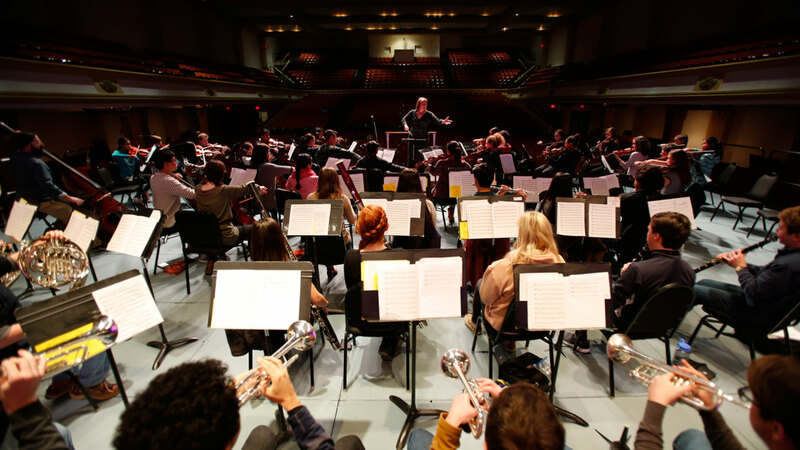 The Youth Orchestra is a 501(c)(3) non-profit organization, which supported in part by the Buncombe County and Asheville City School Systems but also depends on private and corporate donations. October 28, 2018 • 4 p.m.
January 15, 2019 • 6:30 p.m.
March 23, 2019 • 2 p.m.
May 14, 2019 • 6:30 p.m. 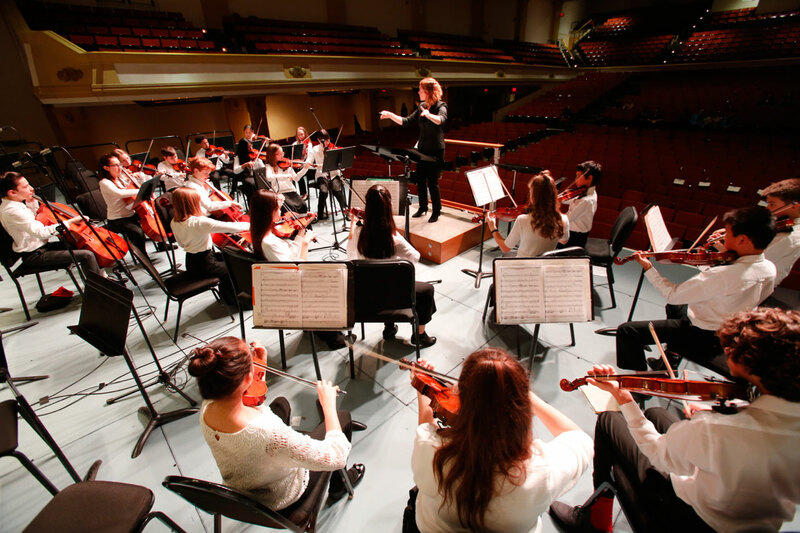 The Youth Orchestra offers high-quality, artistic string playing coupled with advanced, full symphonic repertoire for string, brass, woodwind and percussion students. The most advanced ensemble of the ASYO program, this orchestra rehearses on Tuesdays from 6:30-9:00 in addition to a few yearly activities including the fall retreat, spring tour, and three concerts. The Philharmonia is an intermediate-advanced string ensemble that, in addition to working on string repertoire, performs select symphonic works with the brass and woodwind chamber ensembles. Members must be solid in rhythm training and comfortable with shifting. Students should have experience using vibrato. Students selected for the Philharmonia rehearse Tuesday afternoons from 4:30-6:00 in addition to participating in a fall weekend workshop and sectionals throughout the year. Students will also perform in three concerts per year. The Prelude Orchestra offers an excellent opportunity for first-time orchestra players and for students with little orchestra experience. Open to string students who have a good set-up including posture and basic technique plus studies in note-reading and rhythm training. Students selected for the Prelude Orchestra rehearse Tuesday afternoons from 4:30-6:00 in addition to participating in a fall weekend workshop and sectionals throughout the year. Students will also perform in two concerts per year. The Chamber Orchestra offers an environment for students who have a few years of orchestra experience to sharpen their ensemble skills while learning fun, new music. Open to string students who have a good set-up including posture and basic technique plus studies in note-reading and rhythm training. Students selected for the Chamber Orchestra rehearse Tuesday afternoons from 4:30-6:00 in addition to participating in a fall weekend workshop and sectionals throughout the year. Students will also perform in two concerts per year. The Asheville Symphony Youth Percussion Ensemble is an active ensemble composed of intermediate to advanced percussionists. This ensemble performs a variety of literature thus providing the students with a comprehensive performing experience. Percussion Ensemble is the “laboratory” in which skills and techniques learned are “applied.” The director encourages performance in percussion ensemble since participation in the ensemble brings one into contact with the most strenuous of demands ever placed upon the percussionist. Outstanding performance and comfort in percussion ensemble guarantees outstanding performance and comfort in any musical ensemble. It is without question the most important activity for percussionists. Students that audition and are accepted as a member of the ASYO percussion section will first and foremost be placed into the percussion ensemble. Members of the percussion section are evaluated and selected by both the conductor and the percussion director for participation in both the Youth Orchestra and Philharmonia depending upon repertoire. Percussion Ensemble meets on Tuesdays from 5:30-7:00 p.m. Orchestra assignments will affect each individual student’s start and end time. Emily Schaad started her career on violin and viola, attending The Juilliard School and earning a B.M. in Viola Performance from Curtis Institute of Music. She holds an M.A. in Appalachian Studies from Appalachian State University and is a doctoral candidate in Music Education at Boston University. Ms. Schaad is a founder and artistic director of Stringendo, Inc., a non-profit community music school in New York’s Hudson Valley comprised of seven youth orchestras, five traditional fiddle groups, and a summer camp. During her tenure as a conductor with Stringendo, Ms. Schaad led annual student trips across the country and to the United Kingdom. Her ensembles have performed at music education conferences, competitions, evaluation festivals, and in schools, concert halls, and castles. Ms. Schaad has taught elementary, middle, and high school strings in New York State and is a frequent guest conductor for all-county and regional festival orchestras. She has studied conducting with Donald Portnoy and David Rudge, and participated as a fellow in Conductors Institutes at University of South Carolina, Bard College, and Conducting Masterclasses of London. Emily is also a seasoned old-time musician, and has spent time learning from older fiddlers in Tennessee and North Carolina. She has taken first place in fiddle and old-time band at numerous fiddlers conventions, and released an album in 2013 with Americana stringband Old Buck. She regularly teaches at traditional music weeks such as Swannanoa Gathering and Augusta Heritage Center, and teaches old-time fiddle at Warren Wilson College. Ms. Schaad relocated to Asheville in 2015. In addition to ASYO, she conducts the Greenville County Youth Orchestra’s Philharmonic and Young Artists Orchestras, teaches violin and viola, and performs as a violist with Asheville and Greenville Symphonies. Brian Garland serves as Professor of Trumpet at Mars Hill University, General Manager and Brass Instructor for the Asheville Symphony Youth Orchestra, and Stage Manager for the Asheville Symphony Orchestra. Mr. Garland is an active performer and adjudicator throughout the Southeast and is an S. E. Shires Trumpet Artist. As a pedagogue, Mr. Garland specializes in orchestral studies, classical solo literature, and brass quintet repertoire. His students have most recently been accepted to such prestigious summer festivals such as the Brevard Music Festival and the Eastern Music Festival and have gone on to attend music schools and conservatories across the United States. As of Fall 2017 Mr. Garland conducts the Asheville Symphony Youth Brass Choir. An ensemble made up of students around the Asheville area training to perform the highest level or literature for brass choirs. Mr. Garland has performed regularly with the Asheville Symphony Orchestra, the New England Philharmonic, and the Mercury Orchestra of Cambridge. He has also performed across New England and the Southeast with a variety of chamber ensembles including the Accent Brass Quintet. As a strong advocate of contemporary music, Mr. Garland regularly commissions new works for brass, including “Lullaby” by Ted Oliver for Brass Quintet, which was performed in Boston at Symphony Hall as part of the WCRB Classical Cartoon Festival. Mr. Garland holds degrees from the Boston Conservatory (MM 2014) and the University of North Carolina School of the Arts (BM 2011). While in Boston he studied with Steve Emery, one of the top trumpet pedagogues in the United States, who has performed with world-renowned ensembles, including the Boston Symphony Orchestra and the Boston Ballet. While growing up in North Carolina he studied with Judith Saxton and Dr. Brad Ulrich. He currently lives in Asheville, NC, with his girlfriend Sarah and dog Egor. Amanda Tant directs the orchestra and chorus programs at Hendersonville Middle and Hendersonville High Schools. In her fourth year of teaching, Amanda regularly takes students to Junior and Senior Western Regional Orchestra events, North Carolina All-state Honors Orchestra, All-county Honors Chorus, and Mars Hill Choral Festival. She also serves as music director of the annual “Senior Play” production where she coaches vocals and conducts the pit orchestra. Amanda attended Appalachian State University as a North Carolina Teaching Fellow, graduating with a Bachelor of Arts in Music Education. In 2013, Amanda received a full assistantship to begin a masters in Viola Performance at ASU. She also served as the violist in the Hayes String Quartet, an endowed graduate ensemble. She is the current violist of the Cafe String Quartet and is a member of the Hendersonville Symphony Orchestra. Amanda resides in Asheville with her husband, Nathaniel Habel and dog, Khyber. Mrs. Andrea Dennis has been the Orchestra Director at Rugby Middle School in Henderson County for 17 years. She holds a B.A. in Music Education from Appalachian State University and was National Board certified in 2004. She serves as the director of the WNC Music Academy’s Sonata and Brio String Ensembles. Mrs. Dennis was the conductor of the Hendersonville Symphony Prelude and Sinfonietta Youth String Orchestras for more than 14 years, and also has served as a clinician at a variety of summer music camps as well as hosting and directing Western Regional State Orchestra events. Mrs. Dennis resides in Hendersonville, NC with her husband Derek, and daughter Violet. 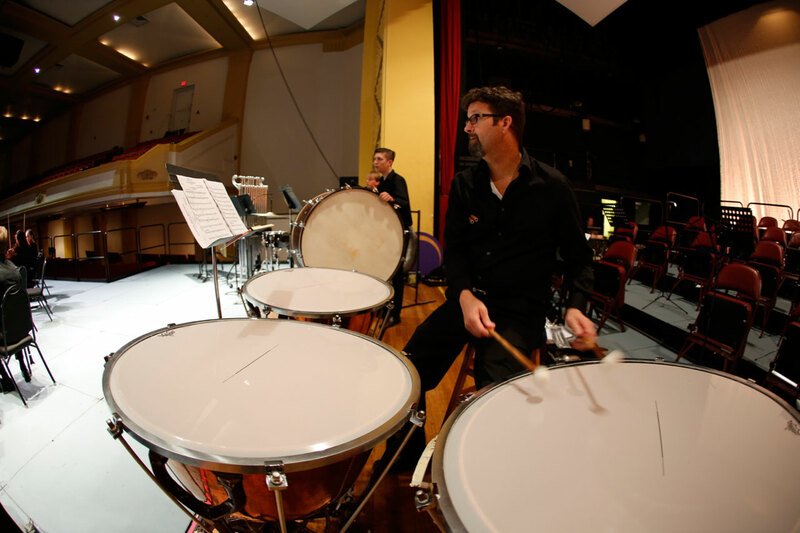 Percussionist Brian Tinkel enjoys a career that draws on his background both in teaching and in performance as chamber musician, soloist and orchestral player. Currently, he is Associate Professor of Music at Mars Hill University in Mars Hill, North Carolina. As Director of Percussion Studies, he oversees all aspects of percussion education. He advises all percussion majors and manages two additional adjunct percussion faculty. He directs University Percussion Ensembles and co-directs the Mountain Lion Marching Band. During his tenure, Dr. Tinkel started additional percussion ensembles to include Marimba Band, West African Ensemble, and Brazilian Percussion Ensemble. Dr. Tinkel performs with the Asheville Symphony Orchestra, Asheville Lyrics Opera, Asheville Symphony Chorus, Southern Appalachian Repertory Theater, Asheville Community Theater, Brevard Philharmonic, and the Johnson City Orchestra. He is currently on faculty with the Asheville Symphony Youth Orchestra serving as Director of Percussion. He was Principal Timpanist with the Enid Symphony and has performed with the Oklahoma Philharmonic. He is co-founder of the Brio Chamber Series, a chamber music series in Western North Carolina, and is a member of Mosaic Flute and Percussion Duo with his wife, Cynthia Roop. Dr. Tinkel earned a Doctorate of Musical Arts from the University of Oklahoma. His dissertation, “Rebonds: A Pedagogical Analysis” is published by UMI. He received both a bachelor’s and master’s degree from the University of Massachusetts Amherst. His past teachers include Thom Hannum, Eduardo Leandro, Dr. Peter Tanner, and Dr. Lance Drege. While being involved in the drum corps activity for two decades, Dr. Tinkel’s performance opportunities led him to being a member of the Boston Crusaders and Star of Indiana. He went on to perform with Star of Indiana’s Brass Theater production where he toured extensively with The Canadian Brass and Nexus. Since devoting his time to teaching, Brian has been on faculty with the Crossmen, Glassmen, and has coordinated percussion activities for Magic of Orlando and the Madison Scouts. In addition he has served as Percussion Caption Director and Arranger for Carolina Crown Drum & Bugle Corps and served as a percussion consultant for The Cavaliers Drum & Bugle Corps in 2008 and 2009. Dr. Tinkel served as Percussion Caption Head for The Cavaliers Drum & Bugle Corps from 2010 to 2013. In 2011, Tinkel led The Cavaliers Percussion Program to the Fred Sanford Award for Best Percussion Performance. In 2014, Dr. Tinkel began a position as percussion consultant with The Cadets Drum & Bugle Corps. Dr. Tinkel has been a featured clinician and adjudicator at numerous events across the United States and at the 25th National Cultural Festival and International Exchange in Okayama, Japan. Additionally, he arranges for percussion ensembles across the country. Dr. Tinkel is an artist and clinician for Avedis Zildjian Co., Pearl-Adams Corporation, REMO Inc., Innovative Percussion, and StickTape.com. Brian resides near Asheville, North Carolina with his wife Cynthia, and his two children Lydia and Asher. iolinist Jason Posnock enjoys a versatile musical career both in the United States and internationally. He has performed regularly in such prominent American ensembles as the Philadelphia Orchestra and the Pittsburgh Symphony Orchestra, and has accompanied them on tours to Europe, South America, the Far East and New York’s Carnegie Hall. Mr. Posnock is also an active chamber musician and recitalist, having appeared in venues throughout the United States, England, Puerto Rico, and India. Concertmaster of the Asheville Symphony Orchestra since 2007, Mr. Posnock has previously held the positions of Concertmaster of the Clarksburg (WV) Symphony Orchestra and Concertmaster of the McKeesport (PA) Symphony Orchestra. He has often been invited to perform with the Pittsburgh Symphony, as well as serve as Guest Concertmaster of ensembles such as the Bangor, Roanoke, Erie, Westmoreland, and Altoona Symphony Orchestras. In addition to his performance schedule, Mr. Posnock has devoted much of his time to teaching and working with young musicians, serving on the faculty of the Brevard Music Center, as Artist Lecturer in Violin at Carnegie Mellon University, conductor of the Intrada Strings preparatory orchestra, and maintaining a busy teaching studio. Presently, Mr. Posnock resides with his family in Brevard, NC, serves on the faculty of Brevard College, and is the Director of Artistic Planning & Educational Programs at the Brevard Music Center.